President Donald Trump held a campaign-style rally in Pensacola, Florida, where he endorsed GOP Senate candidate Roy Moore just days before the election. President Donald Trump on Friday urged voters to elect a Republican Senate candidate in Alabama who has been dogged by allegations of sexual misconduct, warning that America "cannot afford" to have a Democrat win the hard-fought campaign instead. Trump gave a boost to the campaign of GOP Senate candidate Roy Moore during a raucous campaign rally in the Florida panhandle, near the state line with Alabama. "Get out and vote for Roy Moore. Do it. Do it," Trump told the crowd. "We cannot afford, the future of this country cannot afford to lose the seat," Trump said, referring to his party's razor-thin 52-48 advantage in that chamber of Congress. 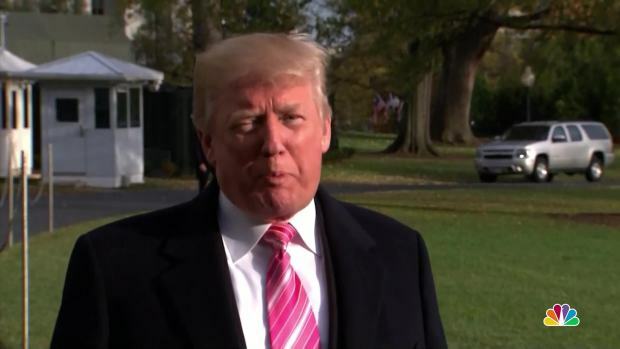 As President Donald Trump departed the White House Tuesday, he stopped to speak with reporters about the ongoing Roy Moore controversy. Trump said Moore's opponent, Doug Jones, is a "liberal Democrat" who would be "completely controlled" by Democratic leaders Nancy Pelosi in the House and Chuck Schumer in the Senate. "He's their total puppet and everybody knows it," Trump said during a wide-ranging speech that included riffs on the U.S. immigration system and the nation's economic performance since he took office. 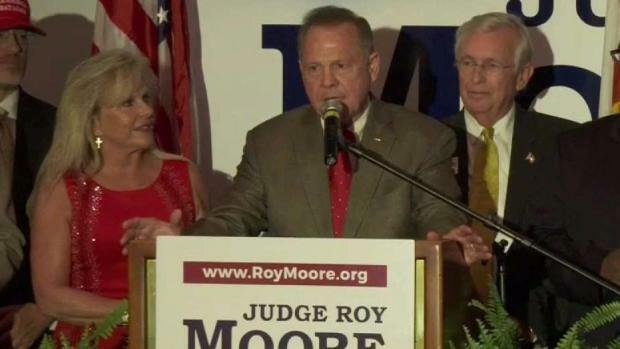 He touched briefly on the closely watched Senate race that will be decided when voters in next-door Alabama go to the polls Tuesday. "We need somebody in that Senate seat who will vote for our Make America Great Again agenda, which involves tough on crime, strong on borders, strong on immigration," Trump continued. As Trump spoke about Moore, Moore tweeted Trump's comments to his own followers. Trump also taunted Beverly Nelson, one of Moore's accusers, who had presented a yearbook inscription by Moore as a key piece of evidence that the candidate knew his accuser. Nelson said Friday she had added a notation marking the date and place where it was signed. "Did you see what happened today? You know, the yearbook? Did you see that? There was a little mistake made," Trump said, shifting to a sing-songy voice. "She started writing things in the yearbook." Trump then mentioned Nelson's lawyer, Gloria Allred, and said, "Anytime you see her, you know something's gone wrong." Trump had reinforced his support for Moore earlier Friday by tweeting a similar message. Moore, who is 70, has been dogged by multiple allegations of sexual misconduct, including accusations that he molested two teenage girls and pursued romantic relationships with several others while in his 30s. Moore has denied the allegations. During the rally, Trump also crowed about stock market gains and other upbeat economic indicators. He said he was confident he'd win re-election in 2020, despite his dismal approval rating. "I think it's going to be very hard for somebody to beat us in a few years," Trump said, pointing to the impact on 401(k) investments. "All you have to say is: With us it goes up, with them it goes down. And that's the end of the election, right?" The White House said the rally was a campaign event for Trump. But the location — so close to the Alabama state line and feeding its television markets — stoked speculation that it was a backdoor way for the president to boost Moore's campaign without actually setting foot in the state. Roy Moore, the Republican candidate for the Senate from Alabama, stands accused of sexual contact with an underage girl. The accuser says it happened decades ago, when she was just 14 -- and he was 32. "It's not that he's not going to Alabama. It's that he is going to Pensacola," White House spokesman Raj Shah told reporters on board Air Force One as Trump flew to Florida. "Pensacola is Trump country. This is a part of the state that voted overwhelmingly for the president in 2016. He'll be traveling back to Florida from time to time, and it's a key state." Shah said the president and White House have made clear that the Moore allegations are "troubling and concerning" and "should be taken seriously." 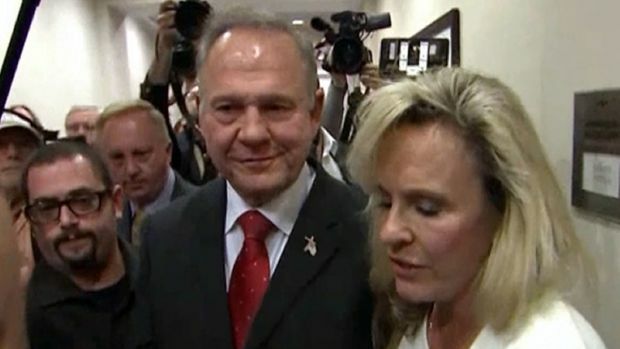 He also noted that Moore has maintained his innocence, and said that should be considered as well. "Ultimately his endorsement is about the issues," Shah said. Trump tweeted earlier Friday that the "LAST thing the Make America Great Again Agenda needs is a Liberal Democrat in Senate where we have so little margin for victory already." Republicans currently have a 52-48 GOP edge in the Senate. He also criticized Jones as being "bad on Crime, Life, Border, Vets, Guns & Military"
Moore tweeted that he agreed with Trump. "You're right Mr. President! We can't Make America Great Again with another radical liberal in the US Senate," he said. "I look forward to working with you to pass the America First Agenda!" Trump, who overcame allegations of sexual misconduct to win last year's presidential election, looked past the charges against Moore and formally endorsed the former Alabama judge this week for the seat once held by Jeff Sessions, now the U.S. attorney general. Top Republicans, including House Speaker Paul Ryan and Senate Majority Leader Mitch McConnell, had called on Moore to step aside after the allegations were made public. Friday's campaign rally was Trump's first since September, when he went to Alabama to campaign for Sen. Luther Strange, who lost the GOP runoff election to Moore. Trump's visit to the Florida panhandle comes in the final days of the Alabama Senate special election campaign to fill the seat formerly held by Attorney General Jeff Sessions. The crowd included some Alabama voters who traveled across the border for the rally. "These are lies, just malicious lies," said John Maddalena, head of the south Alabama chapter of "Bikers for Trump." Maddalena and his wife, Alisha, rode to the Trump rally from their home near Montgomery, Alabama. Alisha Maddalena described herself as a "strong woman" who still doesn't believe Moore's accusers. "You let him sit there and pass judgment on people" as a jurist "for 40 years and don't say anything?" she asked. "You wait until he's running for the Senate to come up with this? That makes you suspicious." "I'm a strong female," she continued. "If things like that happen to you, you need to come out immediately." Others were Trump supporters eager to see the president in person. Forrest Holt, 71, came to Pensacola from neighboring Gulf Breeze with his Marine buddies for the rally. "We love Trump, because he doesn't back down from anybody," said Holt, who said a tax cut is his top priority. 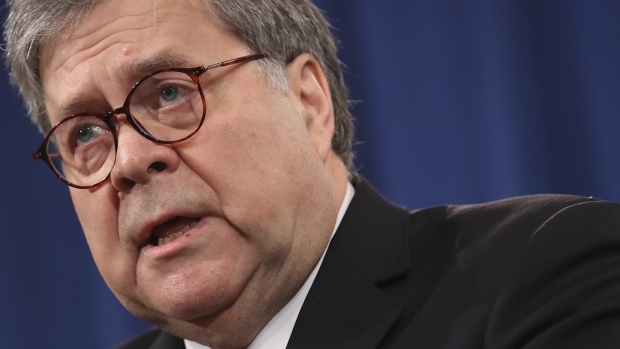 Holt gave Trump credit for Republicans on Capitol Hill advancing competing bills through the process, but said he's not worried about the details. "They're on the right track," he said. "I pay my fair share, and I just want everyone else to pay theirs too."